Join us for a summer night of wonderful music in the beautiful and historic setting of Garvald Church. 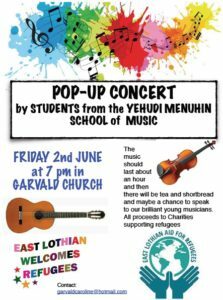 Students from the prestigious Yehudi Menuhin School, including Garvald’s very own Finlay Hay, will perform a variety of pieces. Tickets will be priced at £5 on the door, or are available to purchase ahead of time from Caroline McGregor. 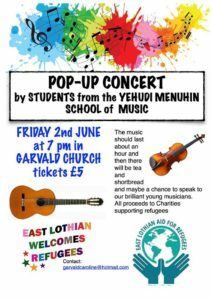 All proceeds will go to two charities doing wonderful work to support refugees in East Lothian: ‘East Lothian Aid for Refugees’, and ‘East Lothian Welcomes Refugees’. Refreshments will be served afterwards, including a tasty variety of home baking. This entry was posted in Events, Fundraisers on May 23, 2017 by Admin. Our very own Finlay Hay from Garvald is bringing home 6 friends from the Yehudi Menuhin School and they are all going to play for us at a pop-up concert on 2nd June at the Church. Please put the date in your diary, come along to hear some fabulous music and help us raise some money for refugees. PS If anyone would like to do some baking for the post-concert gathering, please let me know!! This entry was posted in Announcements, Church, Events, Fundraisers on May 15, 2017 by Admin. The Grand Garvald Jumble Sale is on Sunday 23rd April. If you have items to donate, please deliver it to the Hall on Saturday 22nd April or to Caroline McGregor at The Old Schoolhouse before then. This entry was posted in Events, Fundraisers on April 13, 2017 by Admin. 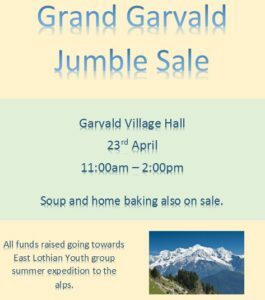 The Return of the Great Garvald Jumble Sale!! Save the date and save your jumble… either deliver it to Caroline McGregor at The Old Schoolhouse anytime, if you want rid of it, or bring it round to the Village Hall on Saturday 22nd April. This entry was posted in Events, Fundraisers on March 30, 2017 by Admin. Garvald Grange garden is open as part of the national open gardens scheme. The owners have transformed this garden over the last 24 years from a bare landscape into a haven for wildlife. Beehives feature in the orchard and vegetables, shrubs, roses and herbaceous plants grow in the small walled garden beside the house, under a huge walnut tree. There are two ponds with a resident population of mallard and several new woods plus mature oak coppice and other hardwoods. For more information, see the Scotland’s Gardens website. This entry was posted in Events, Fundraisers on June 11, 2016 by Admin. A big thank you to everyone involved in the Garvald Hogmanay Hoolie, including the organisers, the band and those who came along and danced the night away. 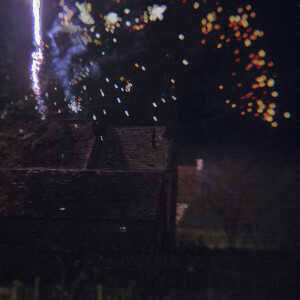 Thanks also for your roll-the-£1-coin donations which raised over £60 for the refugee crisis and thanks for the fireworks at The Garvald Inn. All helping our community to bring in the New Year. 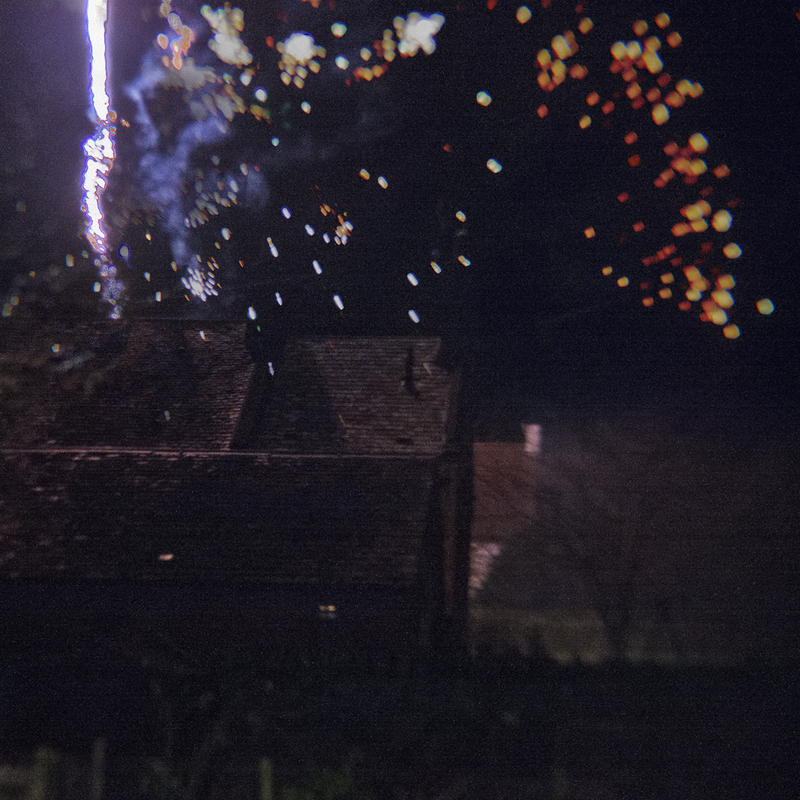 Best wishes to all for a wonderful 2016! Photograph courtesy of Graham Barnes, 2016. This entry was posted in Announcements, Fundraisers on January 1, 2016 by Admin. 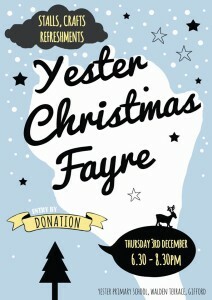 Yester Primary’s Christmas Fayre is this Thursday from 6.30pm to 8.30pm. Why not pop along. 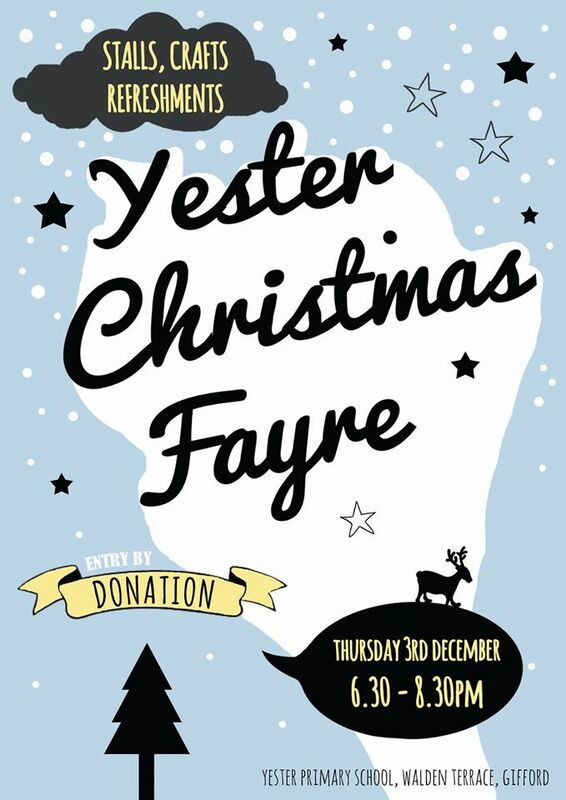 There will be lots of stalls – perfect for some Christmas shopping! This entry was posted in Events, Fundraisers, School on November 30, 2015 by Admin. A reminder about the Concert at Nunraw Abbey this Wednesday, 22 July 2015, at 6.30 pm. A recital of Puccini and the great arias of Opera by Scottish Tenor, Martin Aelred. There will be tea and biscuits to follow and a collection will be taken for the street children in Colombia — “Let the Children live” — suffering from extreme violence, abuse and exploitation. This entry was posted in Announcements, Events, Fundraisers on July 20, 2015 by Admin. In case you’ve not seen all the roadside signs, here’s a quick reminder that the Garvald Jumble Sale is this Sunday, 28th June from 12-2pm! Rolls and teas/coffees will be served. Please donate your unwanted items and come and buy some bargains to help us raise money for the Nepal earthquake appeal. Thank you. This entry was posted in Events, Fundraisers on June 26, 2015 by Admin.